Last week, more than 50 Auggies gathered for lunch at the 3M campus in Maplewood. Despite sharing the same employer, some who had known each other had not made the connection of sharing an alma mater! President Pribbenow shared anecdotes from Augsburg’s history with 3M. During the 1970s, Augsburg’s business program hosted courses at 3M, and many Auggie alumni from this era are still employed there. Currently, more than 200 Augsburg alumni work for 3M. 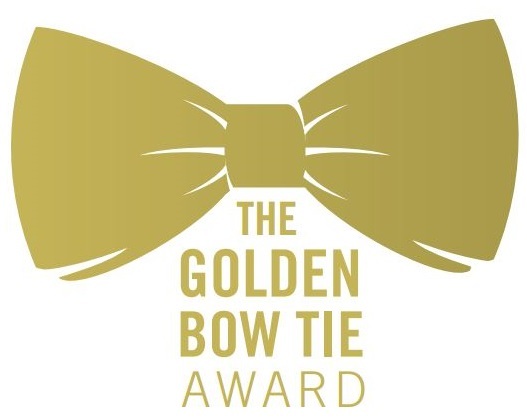 The Golden Bow Tie Award is bestowed upon a leader within the Augsburg Community who exemplifies outstanding achievement, embodies the core values of an Augsburg education and inspires great pride for all Auggies. Nick was also presented with a certificate and gold cufflinks in the shape of bow ties. Nick Gangestad shared three core Augsburg philosophies at Augsburg that have impacted his life: faith, liberal arts, and a unique urban setting. As a student, Gangestad’s faith deepened, and he felt supported in that growth by Augsburg’s core Lutheran values. Liberal arts, the importance of entrepreneurship, and flexibility are also important to him. He attributes his liberal arts education to his ability to lead effectively at 3M. Coming from a small town in Iowa he had a distinct appreciation of Augsburg’s location in the city of Minneapolis. The Augsburg Alumni Association can help you host your own workplace Augsburg Alumni event like this luncheon at 3M. To gather a group of Auggies at your workplace, please contact Amanda Scherer, assistant director of corporate and foundation relations at 612-330-1720 or scherera@augsburg.edu.